Harding’s Braised Short Ribs are an all-American classic especially well-suited for these cold winter months. Their savory, tender short ribs are seasoned to perfection, and are sure please! Once the meat has browned, transfer to deep baking pans. If not overly scorched, use the same roasting pan used for browning your beef to roast the mirepoix. Add the garlic and thyme, and deglaze with the bottle of red wine. Split the deglazed vegetables between the baking pans containing the seared short ribs. Split the veal stock between the pans. Add enough water to just cover the ribs. Bring to a boil and cover with aluminum foil. Bake at 300 degrees for 2.5 hours. Allow the short ribs to cool in liquid but be sure to remove from liquid before they solidify. Reserve your braising liquid and heat for a sauce during meal service. The ratio is two to one, Yukon potatoes to celery root. Cook separately, as they take different amounts of time to bake through. While still hot, both the cooked Yukon potatoes and celery root should be whipped in food processor. Finish like a standard potato puree with heavy cream, butter, and salt. In order to make the puree more fluffy, use the whisk head on your home mixer. Pictured above: Braised Short Ribs with potato and celery root puree. 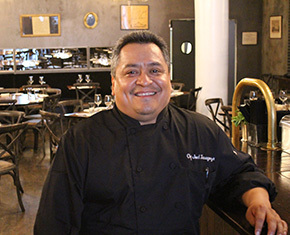 Pictured below: Harding's Chef Joel Zaragoza.